As an innovator in the pneumatic industry since 1939, our Mead Division designs and manufactures a diverse, full-line of prdoucts to produce and control motion. While we offer a broad range of standard products, our engineers routinely design custom systems and components to meet your specific needs. 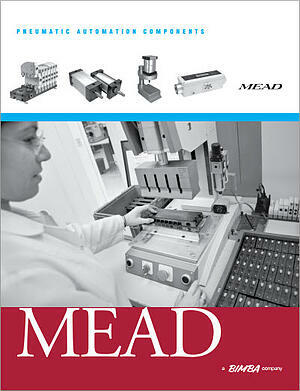 Mead's traditional strength has been in the design and manufacturing of pneumatic components for the industrial automation market, including pneumatic valves, pneumatic cylinders and pneumatic actuators. Applications for our extensive valve and cylinder lines cover a broad spectrum of modern industry. Interested in a Mead Application?